To safeguard your home and prevent costly property damage, it’s important to have high-quality window wells for your basement windows, but not every window well is created equal. All the wells sold by Window Well Experts are constructed from one solid piece of material, which enhances durability and prevents leakage. A window well needs to fit your house’s sides and foundation securely, and we have many sizes and shapes in stock, from wells for vents to full-sized egress window wells. If we don’t have the right parts in stock for your basement windows, there’s a good chance we can custom make a well that suits your needs. Just call or email us for a free estimate. The most common window well near Rockford, IL is made from galvanized steel,and there are plenty of reasons for that. Durable and waterproof, galvanized steel wells will keep rain, snow, bugs and debris away from your windows and out of your basement. Window Well Experts stocks round, square and elongated wells in many sizes, but it doesn’t stop there. We sell accessories to fit securely onto your galvanized steel window well, whatever its size. Match your new wells with “unbreakable” Lexan (TM) polycarbonate covers in a variety of shapes, or to sturdy aluminum grates, ideal for foot traffic and airflow. We also sell window well extensions for wells being installed on existing homes which are unevenly graded. If your basement contains a bedroom, it’s required by law to have an emergency exit and rescue opening. Protect yourself and your family by looking up the local building codes, and check out our options for egress windows wells. 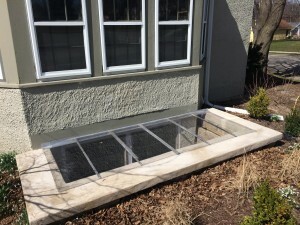 We offer deluxe Stacked Stone composite wells with built-in ladders, as well as Egress Window Wells near Rockford, IL that comply with local and national requirements. Galvanized steel ladders are easy to install on any egress window well. A variety of quick release locks and hinges which make it easy to open your well cover from inside while preventing its removal from outside. You have many choices for window wells near Rockford, IL and a style that suits your home. We sell galvanized steel egress window wells in a bright, modern white finish, as well as galvanized steel and composite wells with decorative stone wall patterns. Accessorize your basement with a scenic window well liner, or install a white reflective liner that drastically improves your window’s natural lighting capacity. Call or email us, and we’ll work with you to find an option that not only protects your basement but adds to its beauty and property value.